All shopping carts must include a purchase of shipping and handling of $3.78. This fee allows me to mail your product and does include tracking. Quantum Philosophy (Q.P.) is a theory of everything and a God philosophy. Q.P. is a model explanting existence within the notion that God does exist. Quantum Philosophy does not search for God or try to prove the existence of God. Here is a simply way of looking at the philosophy. A paradigm is a set of laws. The ultimate paradigm of existence is based on the ultimate set of laws. Q.P. defines these ultimate laws and calls them God’s Laws. They simply cannot be broken. To imagine braking one of God’s Laws would be to imagine not existing at all. Later I will explain why this is necessarily true. Going further into God’s Laws, they are God’s actions. When God does anything it is a law. Science calls God’s actions a force. Through God’s Laws we can interpret what God is saying to us. You can define God’s Laws as a language.If God is all things then the root of all things would be consciousness. Though this is now becoming the base for Quantum Physics, I say this because the 2 attributes we cannot remove from the idea of God is having power and consciousness. Therefore if God does exist and God is all things the root of all things would have to have power and consciousness. I have named this idea The Q.P. Substance Concept. This concept is still within the rules of our paradigm meaning it is based on the God’s Laws. God is powerful enough to make The Substance Concept an untrue idea but God did not. Power and consciousness has been proven to be at the core of all things. Because God’s essence is at the root of all that exist Q.P. interoperates that part of our paradigm as God saying I want you to know that I do exist. All that exist has both power and consciousness. To understand existence Q.P. has categorized all that exist in 3 main categories. Basically all that exist can be summed up between 3 main types of balances between power and consciousness. This is called The Q.P. Binary Concept. If that which exists has the proper balance of power and consciousness it will exist as Manifesting Consciousness, Coherent Consciousness or Perceptible Consciousness. Manifesting Consciousness is the power that manifest into things that has particles and waves. Coherent Consciousness is the power that manifests into a conscious will (the observer). And finally the crown jewel of Q.P., Perceptible Consciousness. Perceptible Consciousness is the fifth fundamental force found in the universe. It will enhance our understanding of physics exponentially. It is the energy that generates what we call space, time, motion and all other things that exist with no physical substance that does not think. 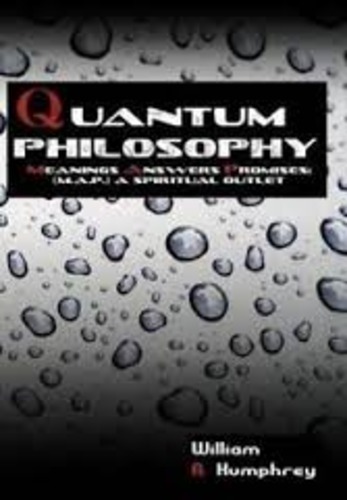 The book Quantum Philosophy: Meanings, Answers and Promises interact with your basic reasoning to help you realize the answers to the questions that has plagued your thoughts. Q.P. is a tour through enlightenment. What is the next scientific breakthrough? How do I become more successful? What is my life missing? What is the meaning of life? What is my purpose? Does God exist? What happens when I die? Can I live forever? This book discusses topics that intrigue the brilliant minds of our modern day. Conundrums and paradoxes about energy, the soul, the mind, the meaning of life, what is man, reality, perception, and death are all systematically explained and rationalized.